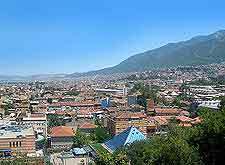 Standing alongside Turkey's 'Great Mountain' (Mount Uludag), the city of Bursa may offer a rather modern appearance, but was actually the 14th-century capital of the historic Ottoman Empire. Therefore, for many locals, Bursa really does serve as the origin of Turkish culture and remains a city with an extremely important past, which dates back more than 2,200 years. 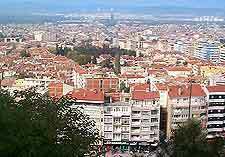 Bursa is currently Turkey's fourth-biggest city, after Istanbul, Ankara and Izmir, and now very much revolves around its central Republic Square (Cumhuriey Alani or Heykel). Close by, the tourist information stands just beneath the Ataturk Caddesi and is a good point of tourism advice, being close to the Orhan Gazi Alt Gecidi and numerous shops. For the top sightseeing in Bursa, tourists will soon discover that the Cekirge neighbourhood is where many of the best historical attractions are to be found, and is known for its famous spas and mineral waters. The Hamams (Turkish Baths) of Bursa are also recommended, along with cable car rides to the top of Mount Uludag, and a visit to the tea gardens of the Culture Park (Kultur Park). For a taste of the city's rich Turkish history, the 15th-century Muradiye Complex (Muradiye Külliye) mosque is a must, as are the famed Tombs of Osman and Orhan, which stand next to the Camal Nadir Caddesi. 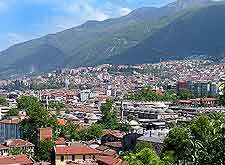 More information about Bursa Tourist Attractions. The Green Tomb is best known in Bursa as the 'Yesil Turbesi' and remains one of the city's most notable landmarks, being known for its colourful tiles and octagonal architecture. Also very imposing is the Great Mosque (Ulu Camii), which overlooks the Ataturk Caddesi are comprises no less than 20 small domes. Other impressive mosques in Bursa include both the Emir Sultan Camii and the Orhan Camii, the latter of which dates back to just before the middle of the 14th century and stands opposite the Municipal Building. More information about Bursa Landmarks and Monuments. A number of interesting museums await Turkish tourists and impart all kinds of information, often focusing on the days of Turkey's Byzantine and Ottoman Empires. 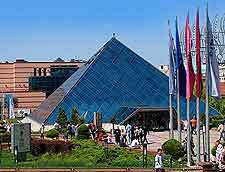 The Ataturk Museum (Ataturk Muzesi) celebrates the life of Turkey's official founder, Mustafa Kemal Ataturk, while the Bursa City Museum is also popular and a good place to learn about the tradition of hand-weaving Turkish rugs and carpets. Nearby and off the Republic Square, the Bursa Art Gallery is one to look out for, and in fact all of these mentioned here are completely free to visit, with no admission charges whatsoever. More information about Bursa Museums. 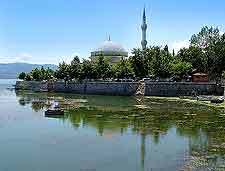 Many day trips present themselves to those holidaying in this part of Turkey and with Bursa being especially near to Istanbul, this has become the city's number one excursion. However, there are a number of other attractions closer to Bursa which are also very appealing, such as the harbour city of Bandirma, and the university city of Eskisehir. Directly to the east, Turkey's capital city of Ankara is just about close enough to make a day trip a viable possibility and is worth considering. 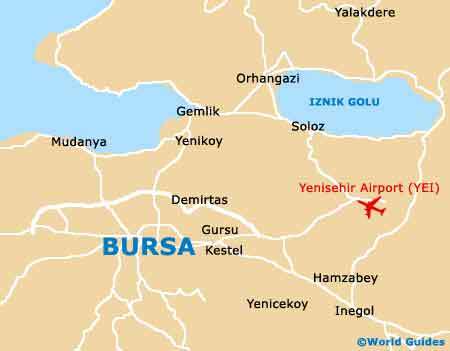 More information about Bursa Attractions Nearby.